I wanted to post a few details about my bedroom with you. I first wanted to share two books with you that really inspired my bedroom makeover. 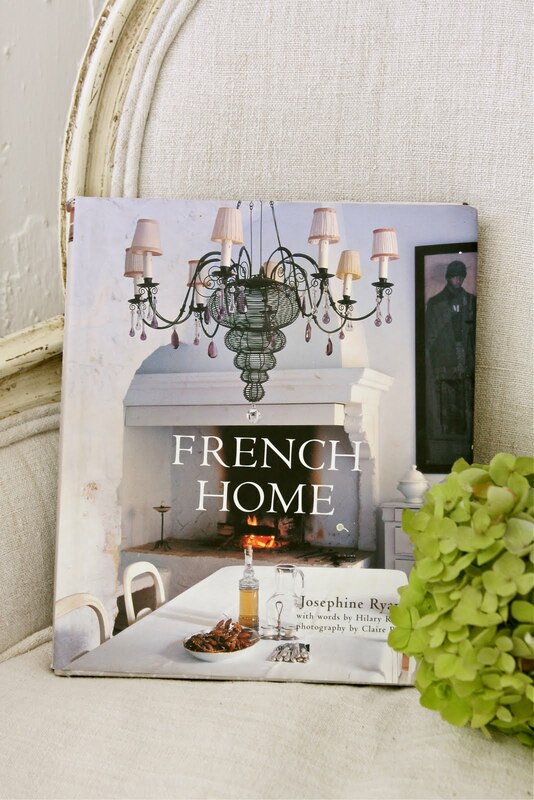 The first book French Home, is one of my favorite books. I never tire of looking at the photos in this book. This book has really inspired me to add a bit of a rustic french style to my home. The second book is Recycled Home. This book inspired me to use some architectural salvage for my headboard. 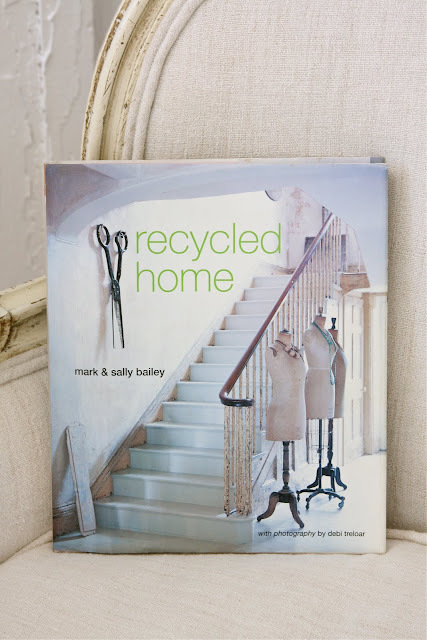 Recycled Home really is a great book because it gives you so many ideas on ways to repurpose so many different things. Both of these books left me inspired to try and create a space that had an authentic french farmhouse feel. I wanted it to feel rustic, but yet romantic. A few details about my bedroom. My mom made the lamp shade. She made it from an antique monogrammed towel. I love how it looks on the alabaster lamp. The grain sack pillows and the runner were also made by my mother. My mom really does a great job sewing. The bedskirt is from Anthropologie. The french linen sheet that is covering my comforter was a birthday gift from my mother. I actually used to use it to cover a chair that I recently got reupholstered. My husband plans to build a frame around the base of our bed out of salvaged wood. We just haven't found the right wood yet. The door on the left unfortunately doesn't even look like the same door that I found. I kind of did a number on it, and I do not mean in a good way. It had a lot nicer patina, until I decided to scrape a lot of the white paint off. I was trying to go for a raw wood look and decided I didn't want thick peeling paint over my head. I can't tell you how mad I was at myself for scraping all of that paint off. I do wish I would have left it alone. I am so glad I left the green door alone. I am lucky that I have a husband who will play musical chandeliers for me! I know that sounds terrible, but you would be surprised how many times the chandeliers in the house get moved from one room to the next. I will someday show you what I did with the mantle that was in here as well as the chandelier. We finally finished that tin ceiling. The 100 year old tin was smoke damaged and needed to be painted. 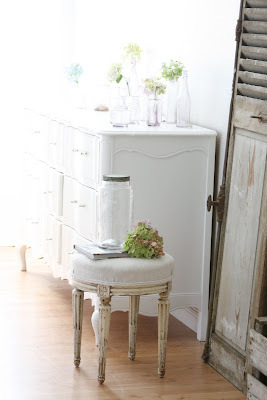 I painted the tin in a Kelly Moore Paint called Country Cotton, in an eggshell finish. My sheered curtains are hanging from birch limbs. My Aunt Mickey inspired me to use limbs as curtain rods back in the 90s. 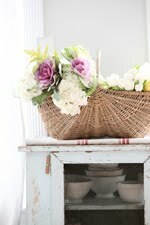 She is from Portland, Oregon and has a new blog, called Vintage Station. It is one of my favorite pieces. I like how simple it is.. I also like how it looks mixed with the rustic doors. I do not have anything hung on the walls in my bedroom. I wanted the room to have a light and airy feel to it. I love the way the light filters through the lavender bottles. This stool used to be out in my living room. When I redid the bedroom I needed something a little more formal to mix with the rustic doors so this stool helped do the trick. I originally bought this old window with the intentions of putting mirrors in the place of the windows. It ended up being too costly. I think I like it better left just how it is. 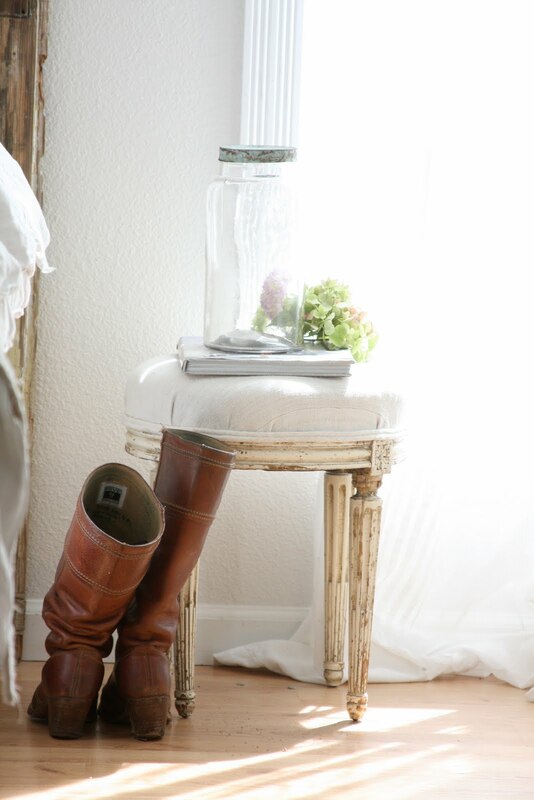 I love using our everyday boots as props around the house. Sorry I had you have to see the same pictures again! Do you live in a new house or an old farmhouse? I live in a newer modular home. We do not own the home we live in, our boss so generously let us pick out this home to live in.... I felt like the luckiest girl in the world. My walls are a Ralph Lauren color called Country Dairy, and I used an eggshell finish. Even though Home Depot doesn't sell Ralph Lauren paints anymore they will look up the formula for you and they will make it in the Glidden paint. You can also find dealers for Ralph Lauren Paints by going to The Ralph Lauren Website. What color of paint did I use on the trim and doors? I used a Benjamin Moore paint, called Decorator's White. I used a semi-gloss finish. Did I distress the doors? I didn't distress the green door, but I did mistakenly scrape a lot of paint off of the door on the left. Are the doors attached to the wall? No, the doors are not attached to the wall, they are just leaning against the wall. Where can we find your post about your bedroom with the before pictures? Thank you so much to everyone who stopped in and left me a comment about my bedroom. I can't tell you how much I appreciated it. I wasn't sure if any of you would like it. Thank you for taking the time to stop in and say hi! I am also guest posting today for my friend, Federica. You can find me over at Sweet as a Candy Blog. OMG how could anyone not love your bedroom! It is just beautiful!! It is so me love everything. i think your doors came out really perfect its a nice touch where the rest is all white. I'm sure down the line you can always add more white to it and change it up a bit. So glad to see you added a post today it's one of the first ones I look for when I get on blog world. just love it! your very talented!! It is beautiful Maria...I really like the doors and your grain sacks! 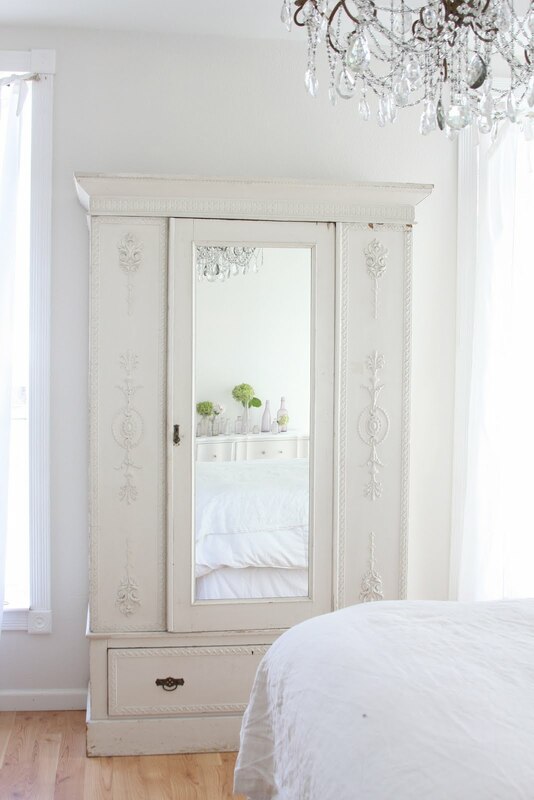 Your bedroom is absolutely beautiful - worthy of being in any interior's book. You have such a great sense of style. I'm wanting to eliminate all the cream from my home and replace it with white (largely thanks to you!) - not sure how it would look though as in Wales we have a lot of rain (we've just had a two hour thunder storm with torrential rain) so I worry it would look too cold here. I can always repaint though - my husband will be delighted when I tell him I want to repaint the entire house! I know I have said this a million times, but a million times it has been true... you have such a gift!!! I love the doors, the ceiling, the chandelier... all of it!!! your bedroom is soooo wunderful. I love it, it's fantastic!!! of c.o.u.r.s.e. everything else is stunning!!! 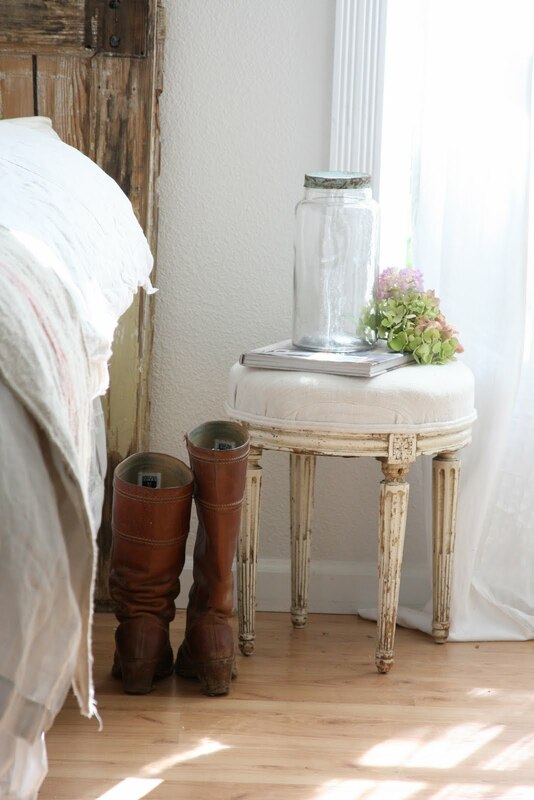 Good Morning Maria ~ your bedroom looks so wonderful, perfect place to kick off your boots at the end of the day! 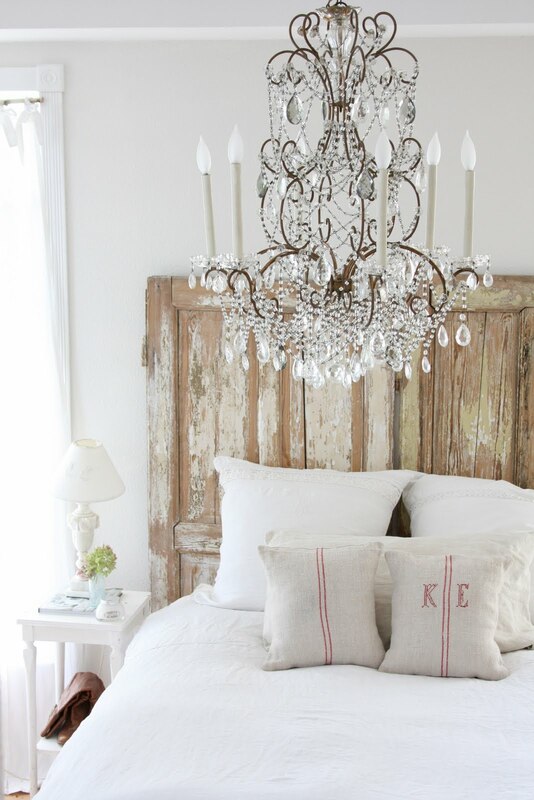 I just love the way the chandelier looks against the old door headboard. Thank you for the heads up on those 2 books, my list is getting loooonger! Have a wonderful weekend!! I think it's safe to say that there is no room in your house that we all won't love! Hola Maria, I love everything, each and every detail at your bedroom, and your mom´s lamp shade is the cutest!!!!! It's all so pretty and relaxing. You did a wonderful job decorating it. I'll have to check into those books. Always looking for good decorating books! But now I have to find all my english word to say that your bedroom (and not only it!) it's wonderfull!!! I sow also your guest post on Federica's blog... WOW! For lack of a better word...I'm just going to have to say...it's simply DREAMY! What an eye you have! Love it all my friend! Such a dreamy space. Good morning Maria! i like your bedroom before...but after your changes I can see many differences - now it seems your room has more substance with all those architectural elements...very much like those two books! I would love to see how you incorporate the look in your kitchen. I'm off to check out the books - thanks for the info on them. Hi Maria, I saw your guest post on Federica's Sweet as a Candy: wonderful! 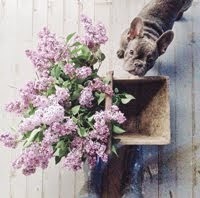 I read your blog since some month and I love your pictures! lovely white, lovely home! In my blog some times I write about new blogs that I discover, and I posted about yours on august 17. It's so pretty! I love how your whole family helped with the room, makes it so special :) I'm sending you an e-mail, sorry it's been awhile! Love it, Maria (by the way, that is my middle name...)!! It is so dreamy and serene... If you ever do make it here to Portland, I would love to meet you!!! There's lots to see and do around here... Have a great weekend! Wow Maria, your bedroom is beautiful, very classy and at the same time so simple, You did a grate job! 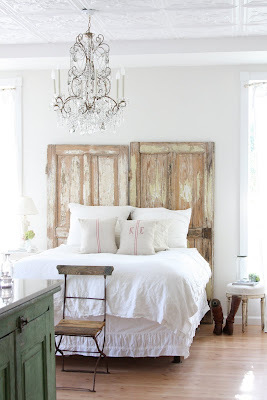 Love the headboard being doors! I think the distressed paint looks perfect.. but I know (all too well) how it feels to wish I just didn't mess with the finish. I try to live with things for 2 weeks to see if I really want to change something.. It's hard but I try..sortof. I have chandeliers that have moved from room to room tooo... that's normal, right? I love your blog. I hope if you have time, you will come over to mine for a visit! Hi Maria, just doing my daily check in with you and so loving the photos of your bedroom. I also went over to your Aunt Mickeys blog....AWESOME! She has some great stuff I already have my eye on. Your home has inspired me to lighten up my decor a bit. Im naturally drawn to Italian/Spanish interiors but I have made some changes in my bedroom recently and Im liking the lighter look. I also placed you on my sidebar...I know you dont have a button so I hope you dont mind I used the photo of your cowboys hats on the alabaster base. Thats just a photo that says it all. Your room is just stunning. I love the doors and I love to shop Maison Reve online...I'm way too far away! Nicely done. I'm off to Federica's! Maria - of course it is FABULOUS with your stamp all over it. So beautiful, and I just love the details you added to it. LOVE the idea of nothing on the walls, no distractions - just a sweet retreat at the end of the day. PERFECT! your bedroom is so beautiful! Your photos and design style are perfection. Your bedroom is gorgeous. So charming, romantic and tranquil. I just love the simplicity and elegance of it. 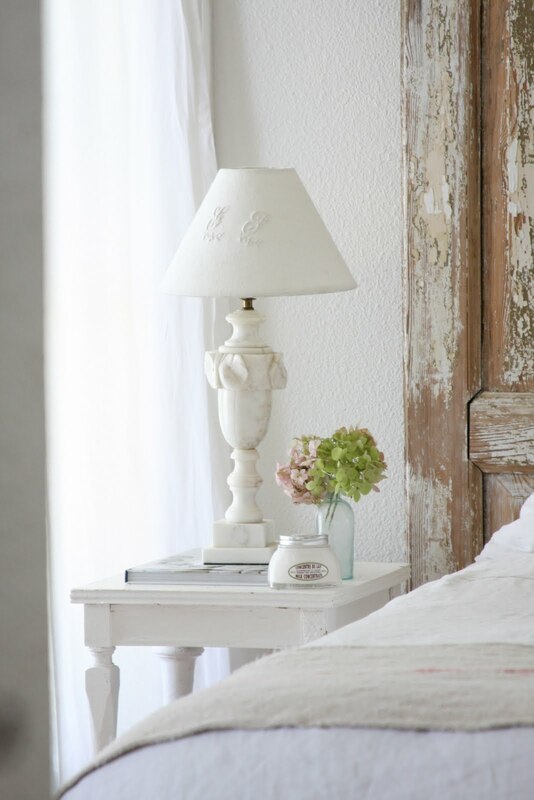 Beautiful touches throughout.....the alabaster lamp, grain sack pillows,, the chandelier...just beautiful, Maria. Stunning is my word for your bedroom! every time i drop by for a visit, my jaw drops open and i feel like i'm drooling on my keyboard. it's all so beautiful. 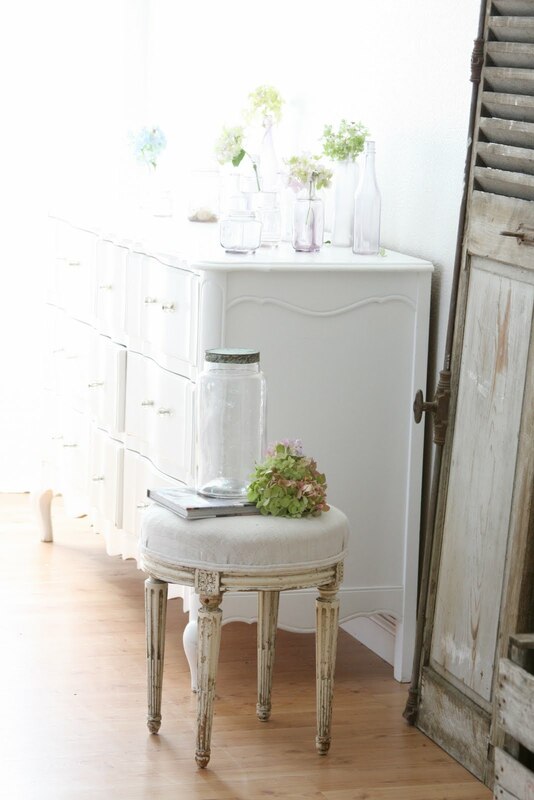 your dressing table/vanity is so, so fantastic! You've really outdone yourself here, Maria! One thing no one else has commented on is what a fabulous job you've done of giving a modular, or manufactured home character. We lived in one awhile back, and to see how you have given yours such unique architectural details is really impressive. 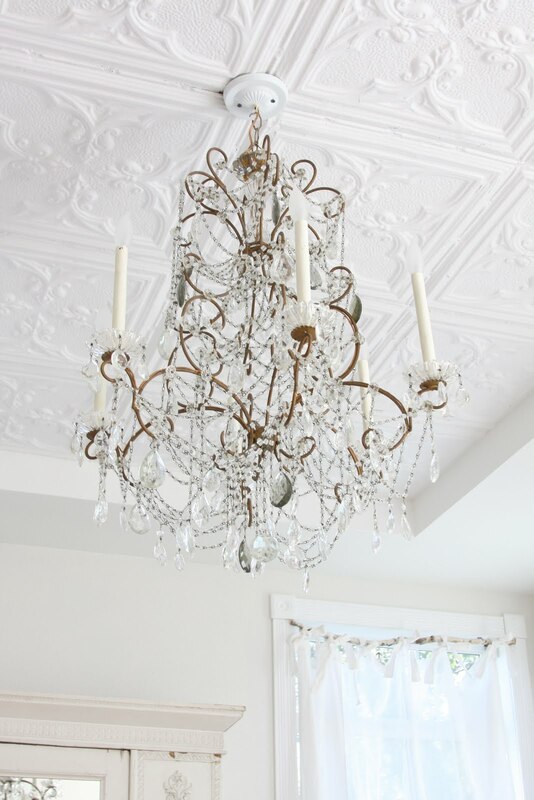 Love your ceiling and chandlier! Oh, your home is just gorgeous...how could you ever be nervous about showing us your bedroom! I really love it and visit your blog often. You are so blessed with talent:). 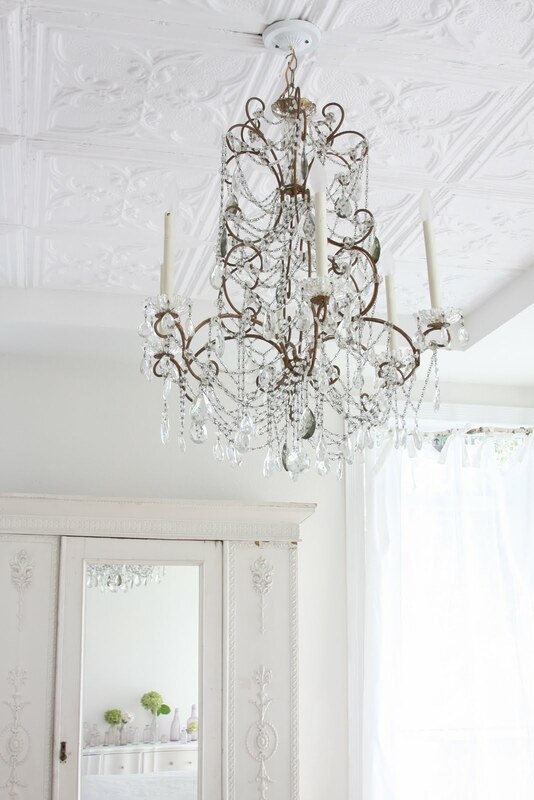 Wow Maria the details in your bedroom are so beautiful...just love them and the chandelier to fall in love for...! Thanks for sharing all of your secrets!! LOVE the after much better! Beautiful job! Great blog, and your bedroom is beautiful!! I have to order those books! 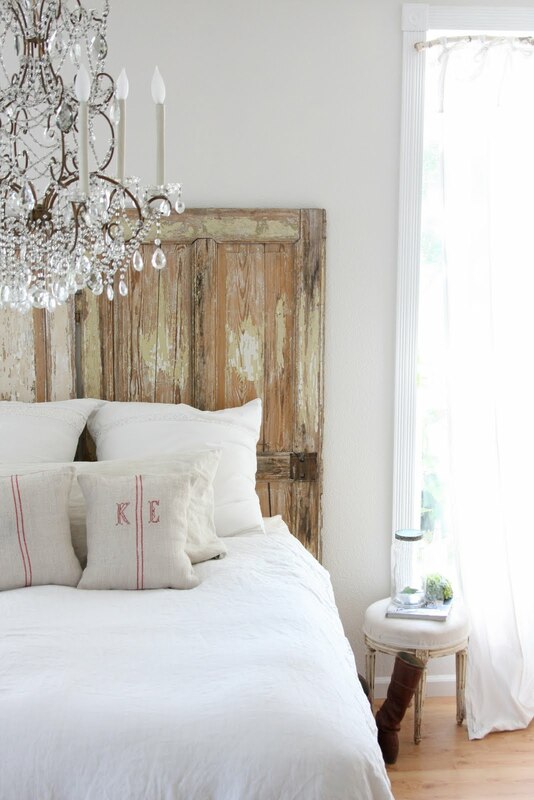 If they helped inspire this GORGEOUS bedroom in some way, I simply must read them for myself. Stunning Maria! You are so gifted!! Holy vintage white! You rocked that bedroom! LOVE IT! Oh, how inspiring! What a great white world you're creating! The whole room is soooooo great, all the little details, colors, etc.! I don't blame you for chipping paint off the door, I have an old window that I need to hang in my living room and every time I walk by it and look at it I swear more paint falls off! ;) Can't wait to see your little "shop!" Girl, we ALL want to go to bed in that room! good morning maria! you have such a way with decorating! everything is so beautiful and reminds me so much of maison reve's style. still dying to get to that store one day. Love the headboard! Love the bedding. have a great day! It was nice to hear some of the details about your bedroom. I wish my mom (or me, for that matter :)) knew how to sew like yours. I LOVE your lamp and the lamp shade she made for it and the pillows (drool). 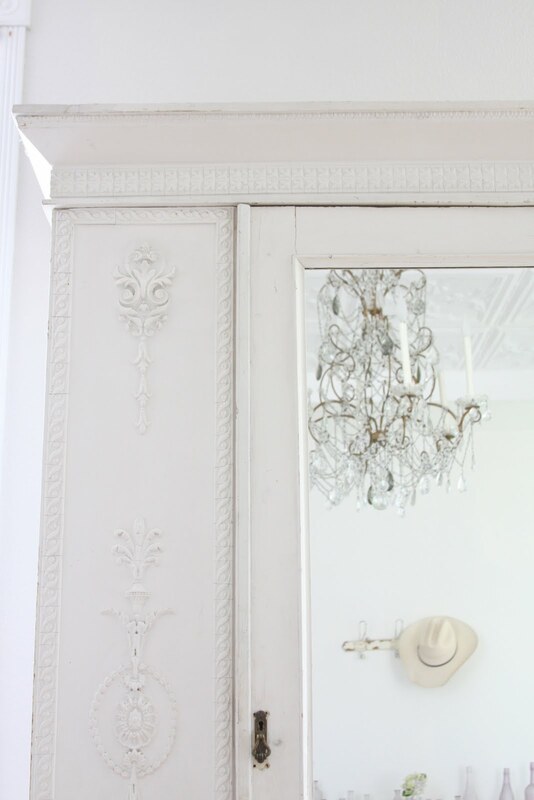 And you wouldn't know that you damaged your vintage door at all... it's gorgeous! Your WHOLE bedroom is beautiful!! I was very surprised and pleased to hear that your home is a modular home. It just goes to show that you don't need an old farmhouse to have that look. You've done a wonderful job!! Can't wait until your shop opens. I know I'll find something I want. your blog has become a 'favorite book' for me. 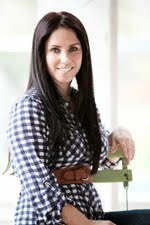 i love looking at your lushly photographed home for inspiring ideas as well as your down-to-earth words which are always reassuring and real. gush gush gush but all sincere! Inspiring - I want everything there! Maria, it is all so beautiful. Your entire home is just lovely in every way. I really adore the tin ceiling...really gorgeous. 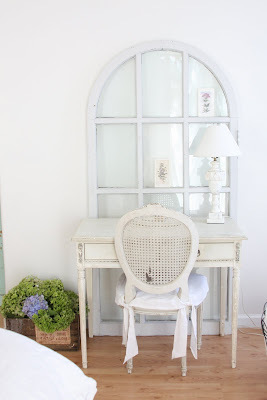 bonjour, je decouvre ton blog, ta chambre est trés belle, les portes anciennes lovely. Maria, I just came across your blog and I'm so glad I did!! Your home and images are lovely. I really like this post and the blog, that I had to become your follower! !Everything so stunning. Your bedroom is so beatiful! I can only dream of having a room as beautiful as yours. It is outstanding! Love love love every detail! Oh, you should never be nervous to share your photos with us! We all just eat them up. i don't know if I could pick just one favorite part of your bedroom, but that ceiling is exquisite. Maria... Just FaB Display using the PeRfeCtLy Chippy Old Doors as Head Boards!!! and Loving All That Bling!!! YOU have some of The BeSt IdeaS... Jeanine,ChiPPy!-SHaBBy! OK my favorite part is the chandelier and the gorgeous bedding! Oh and the ceiling too. MAGNIFICENT!! What kind of a house is it? Architecturally? Just curious. i love your bedroom, looks so comfy and i am especially loving the tree limbs as curtain rods - i have seen that before but i am getting ready to hang my little girls curtains and you reminded me of that idea - so thank you!! your bedroom is so beautiful and inviting! i love everything about it!! you are one talented lady! your bedroom is amazing, Maria! i'm in love w/ those old doors - so ingenious to use as headboards. but LOVE when someone isn't a snob or afraid to reveal their secrets. ;) it makes ya kinda go, "oh.. maybe i could do that too!" and all the inspiration just keeps flowing round and round - as it should! Gorgeous. 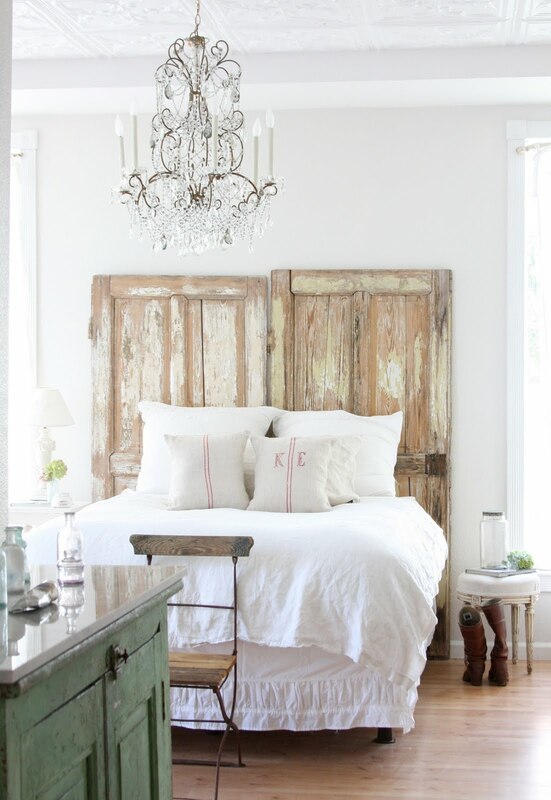 I would kill (sorta) to find doors like that for a headboard. Just charming!!! The old window is great. Did you see this blog where they made their own mirrors at a fraction of the cost? The end results looked great. I love the doors. Are they sealed, then, since you are using them as a head board? I have an old door I wanted to do the same thing with but I'm so nervous about the paint chipping... What could I use to seal it? That is so beautiful!! I especially love the doors as a headboard. Where did you get them?